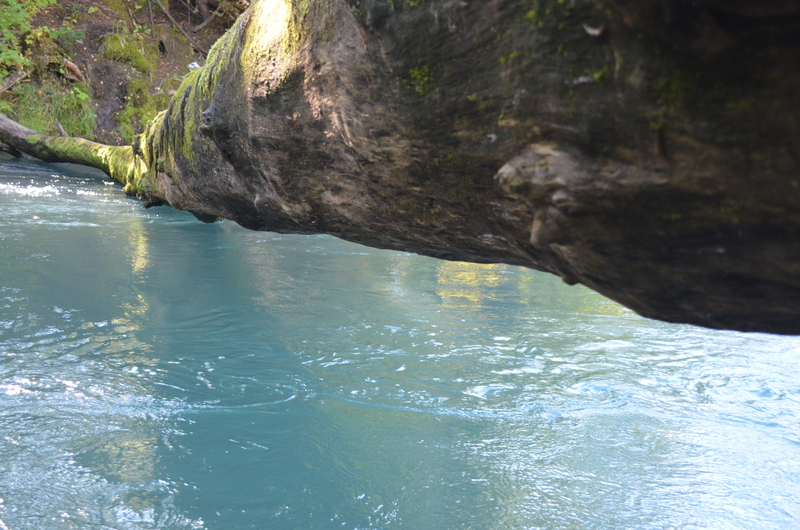 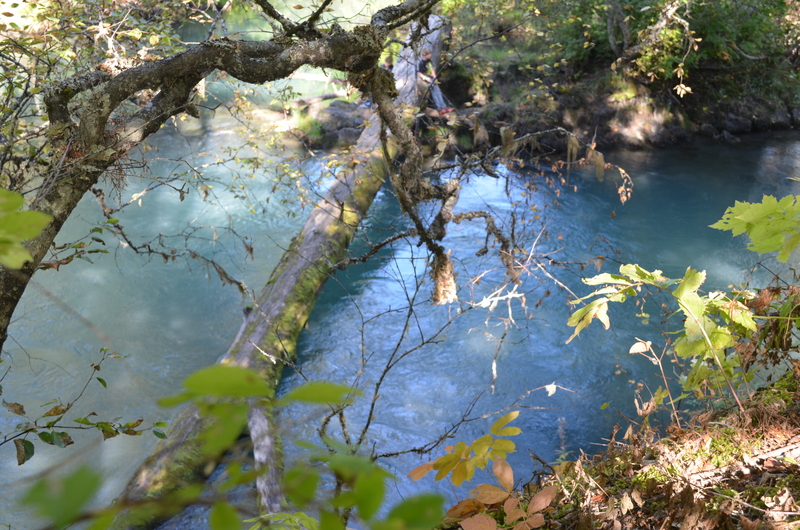 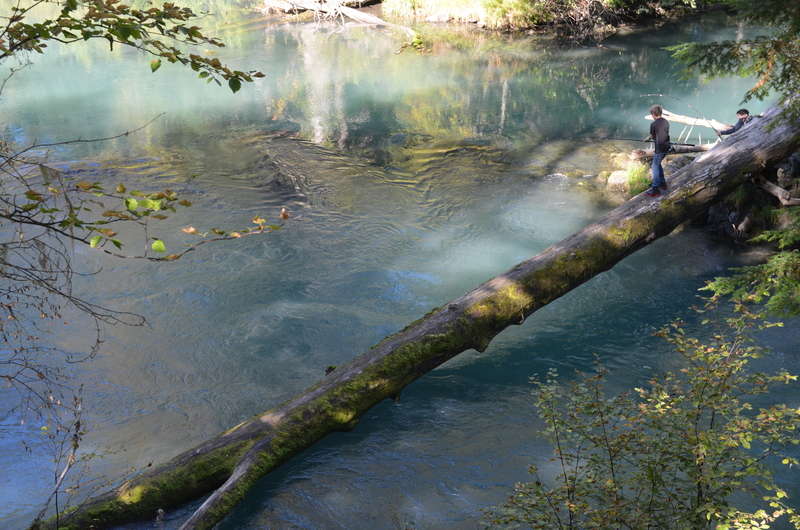 The story is connected to our previous post “Swim in the turquoise pool of the forest” There is something special about our valley. 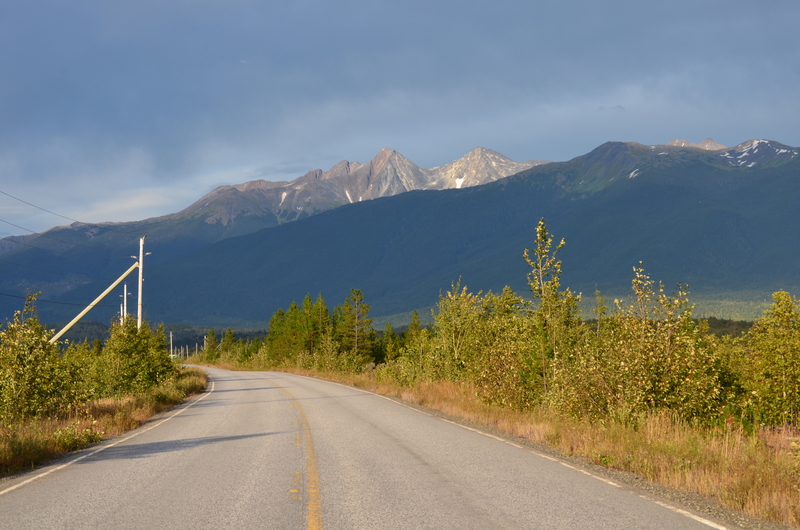 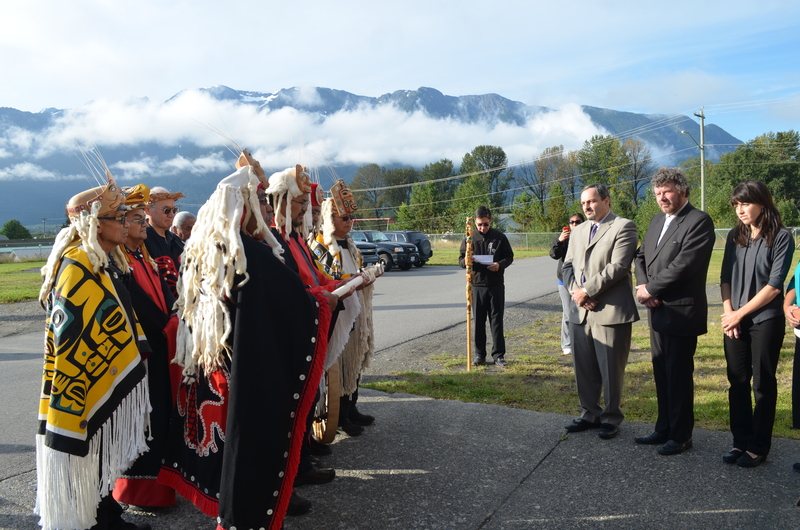 Here we live in this place that belong to the Nisga’a First Nation . 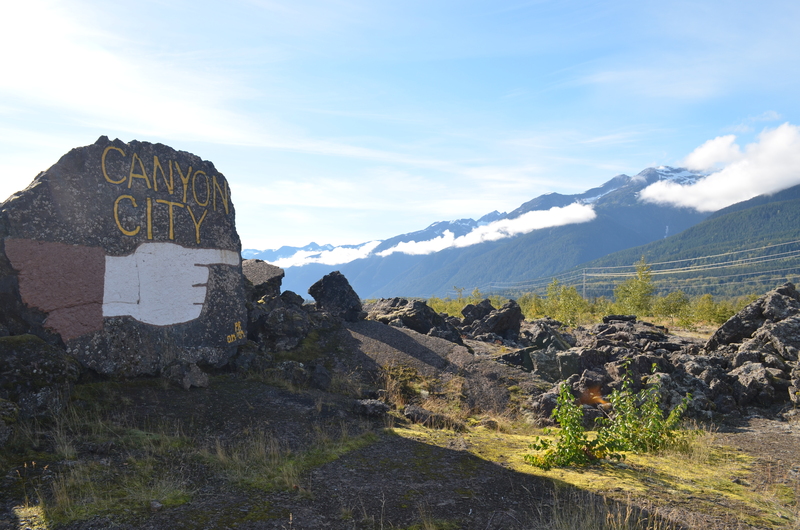 The population is small and our village is squeezed between the mountain, river and the lava beds. 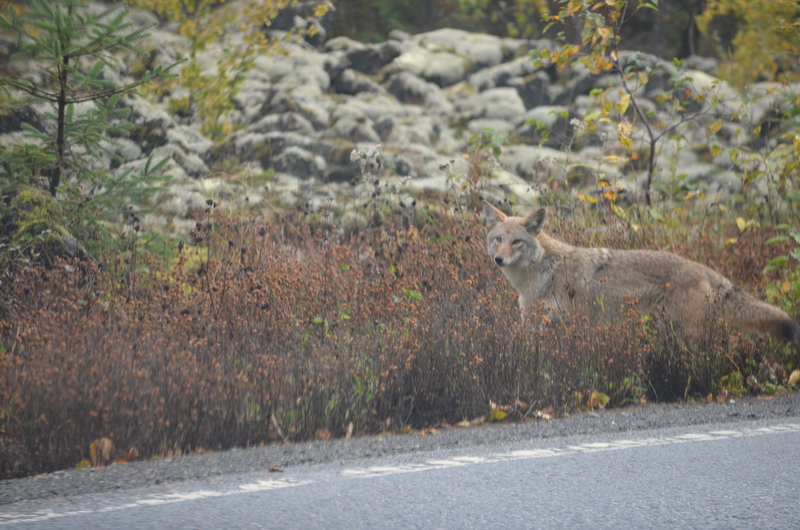 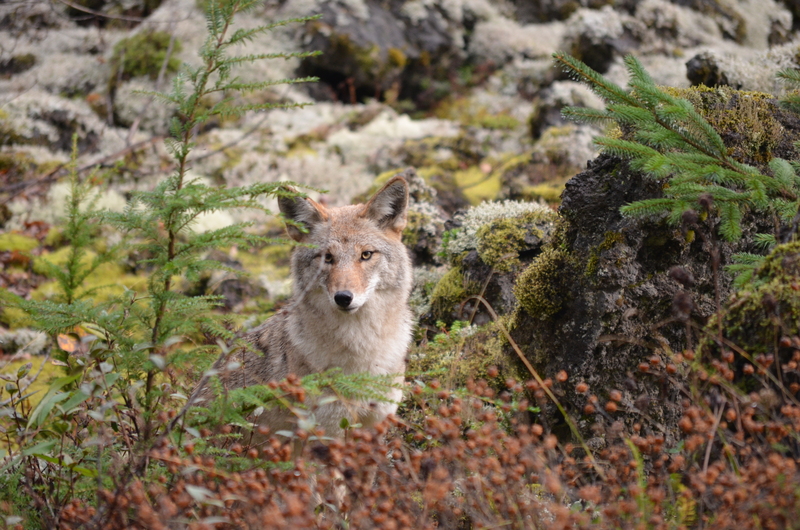 Coyote is seen quite often near the lava bed lots of natural small holes and caves for dens. 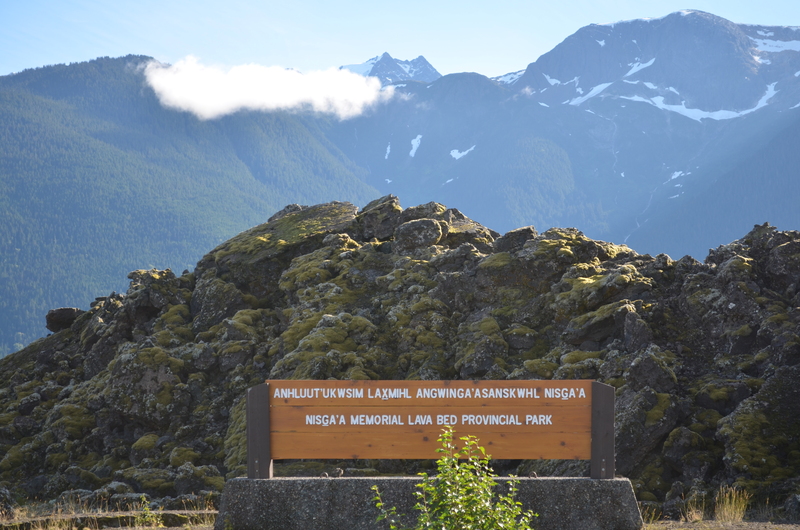 Nisga’a Memorial Lava Bed Provincial Park (Nisga’a: Anhluut’ukwsim Laxmihl Angwinga’asankswhl Nisga’a) is a provincial Park in the Nass River valley in northwestern British Columbia, Canada, about 80 kilometres north of Terrace and near the Nisga’a Villages of Gitlakdamix and Gitwinksihlkw. 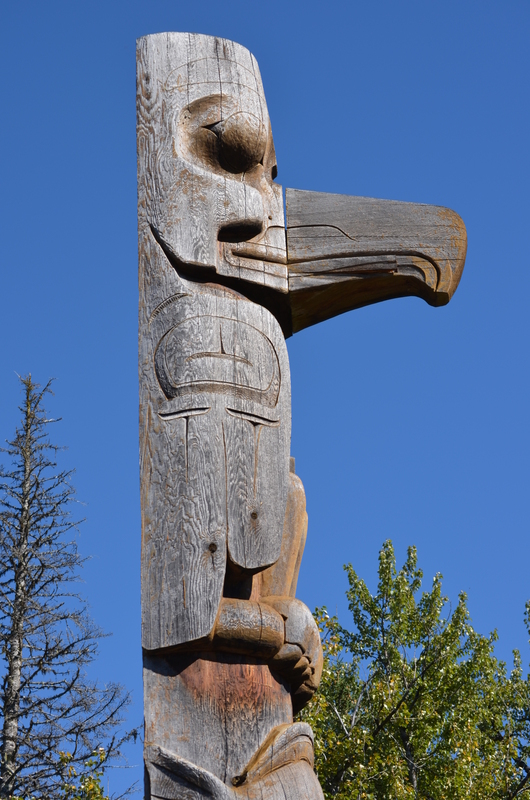 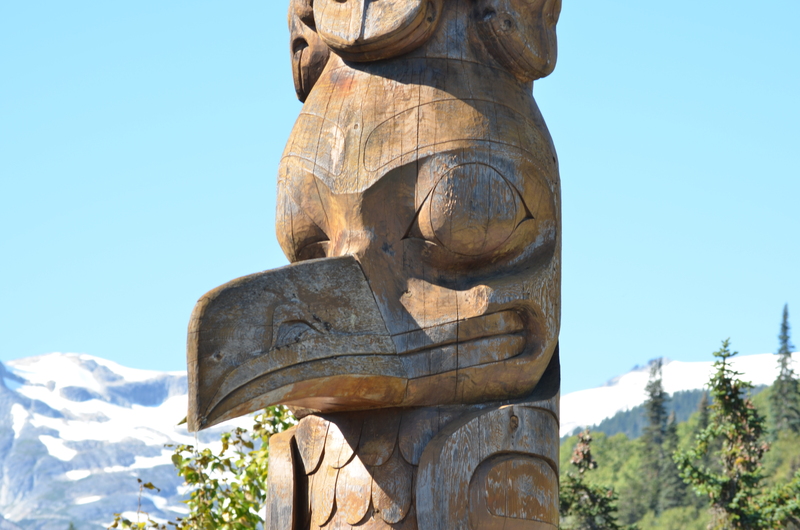 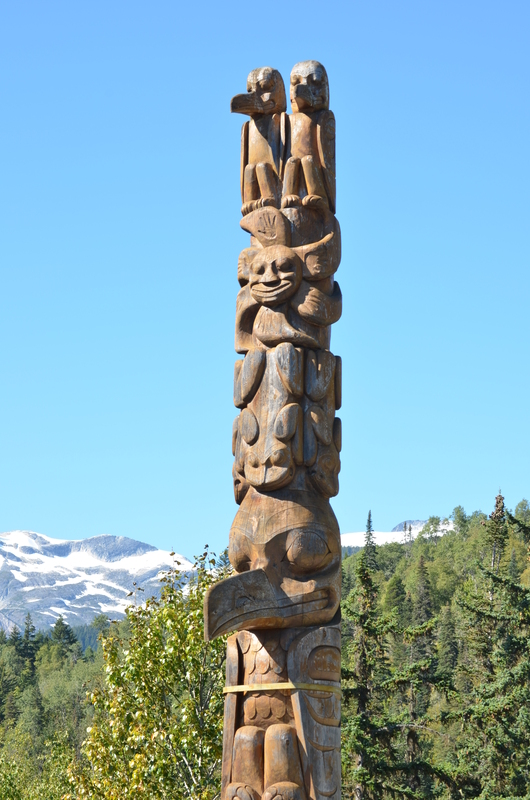 The park was established by Order in Council on April 29, 1992, expanded in 1995, included in the Nisga’a Treaty in 2000, and is the first park in the province to be jointly managed by the government and a First Nation. 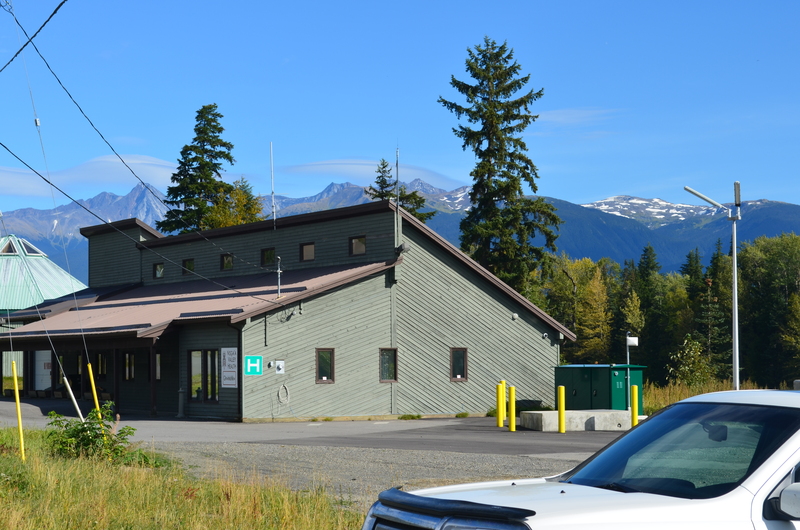 An interpretive centre in a traditional Nisga’a longhouse informs visitors about the Nisga’a legend that accounts for the lava as well as geological causes. 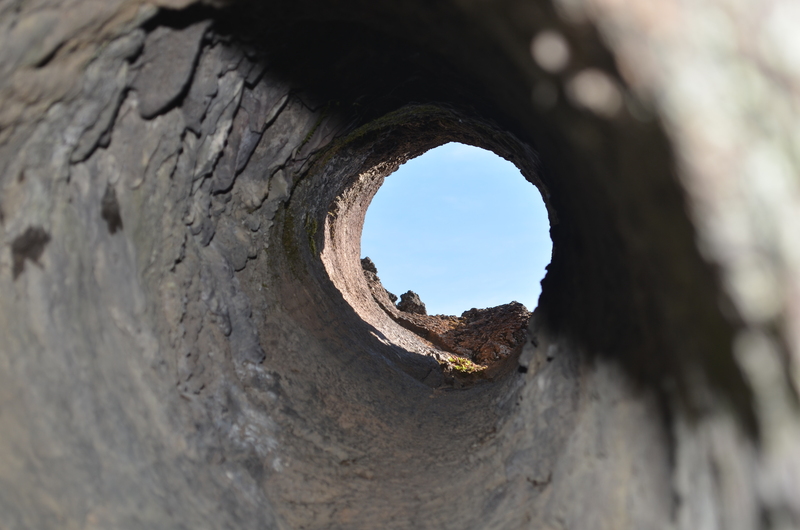 The park has waterfalls, pools, cinder cones, tree moulds, lava tubes, spatter cones, a lava-dammed lake, caves and other features created by lava flows. 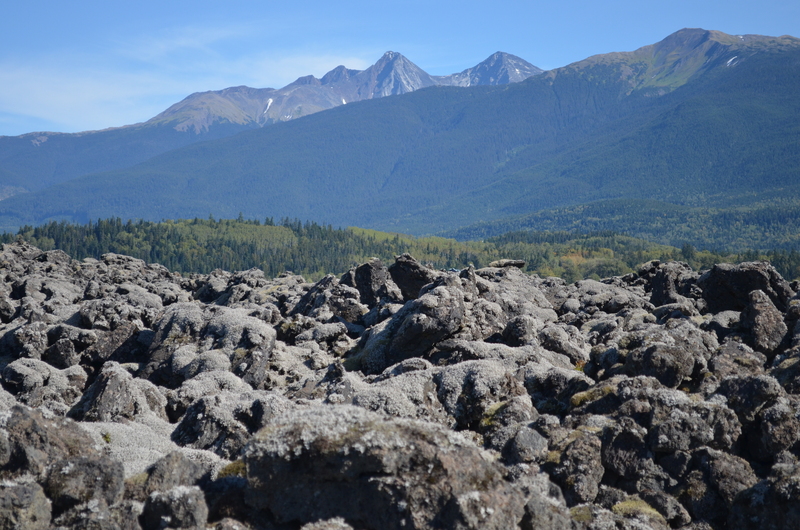 The parks aims to protect moose, goats, marmots, bears and many other species of wildlife. 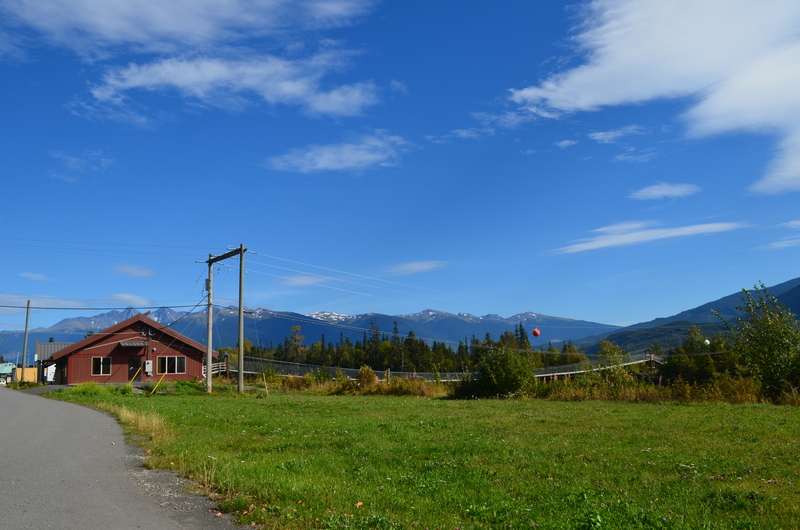 The park covers 178.93 square kilometres in area. 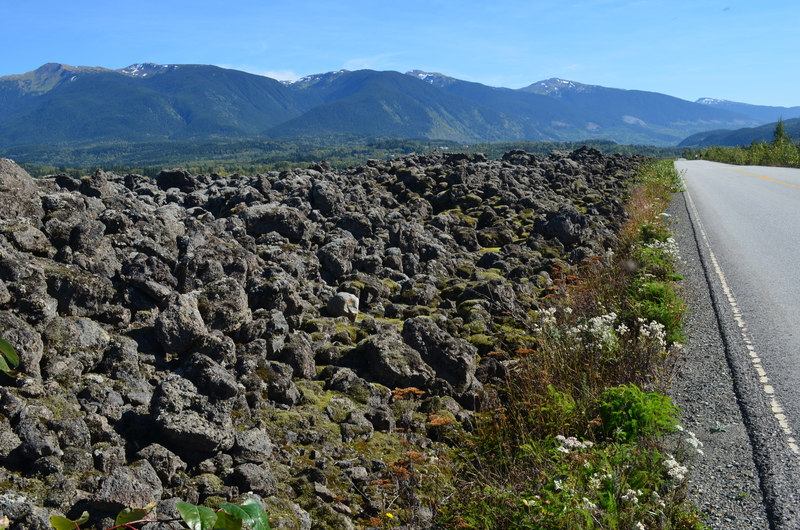 “It is believed to be the site of Canada’s most recent volcanic eruption and lava flow, a geological disaster that killed an estimated 2,000 people. 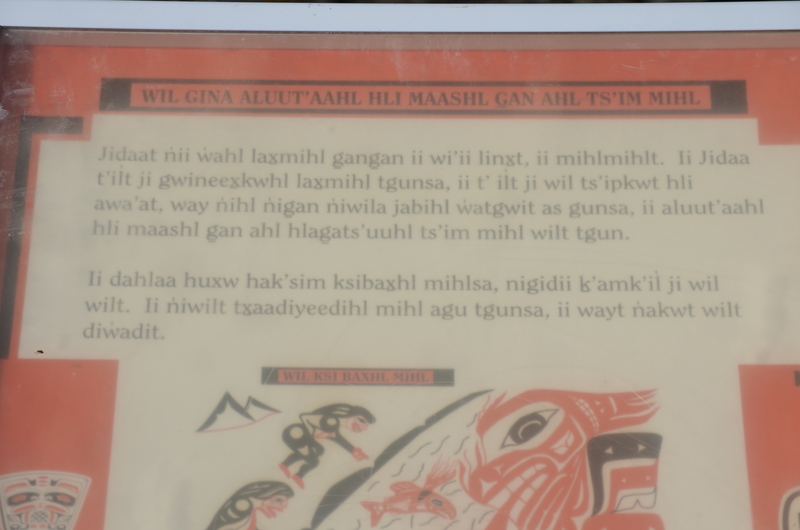 Nisga’a oral histories record the names of two villages destroyed in the eruption, Wii Lax K’abit and Lax Ksiluux. 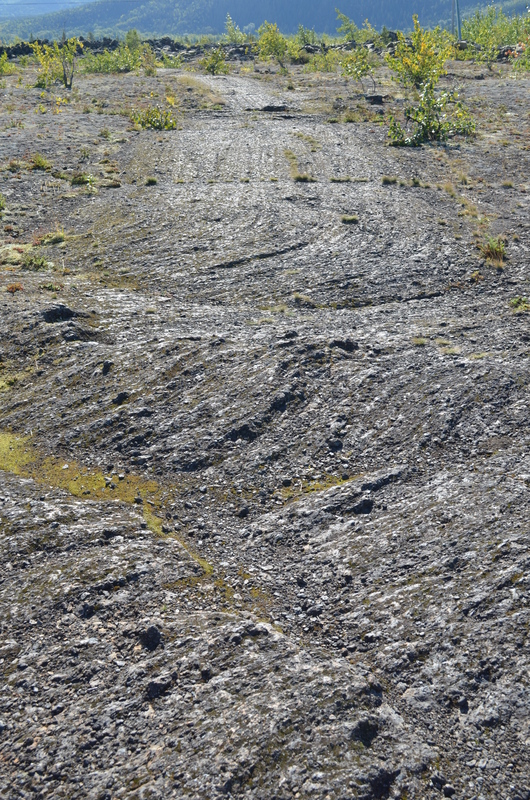 Lava flow show the ripples that formed as the lava cooled, now they have become a walking trail for animals and people. 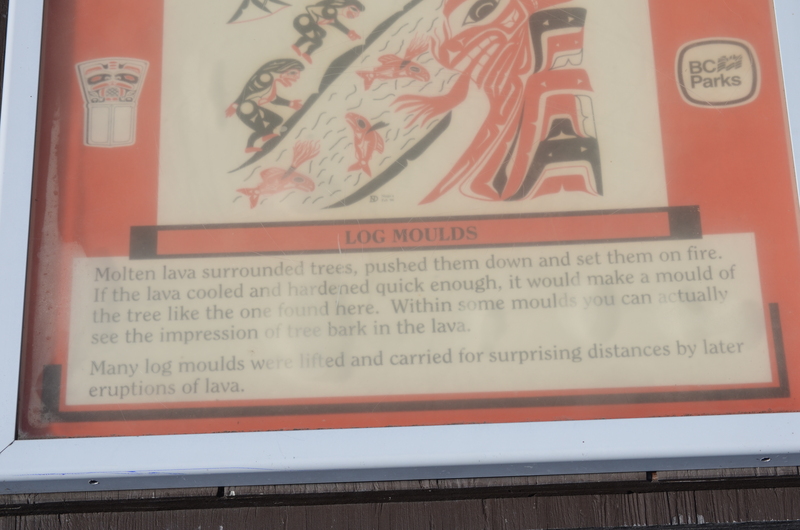 From Sign: Log Moulds Molten Lava surrounded trees, pushed them down and set them on fire. 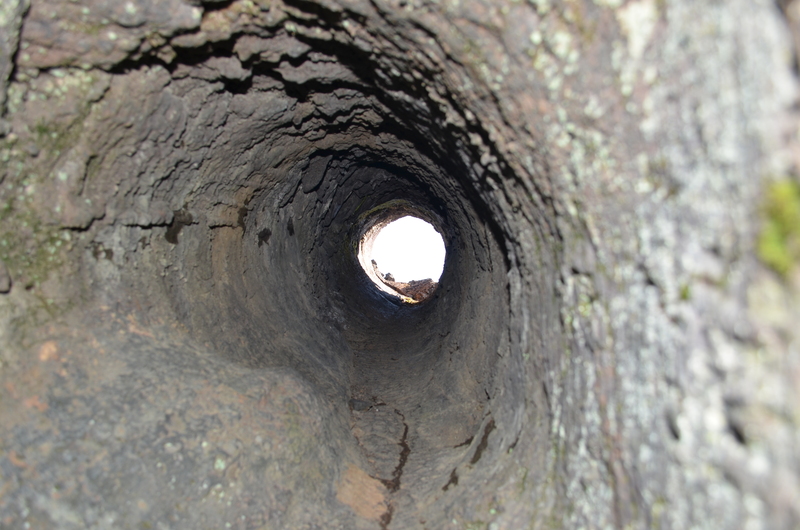 If the lava cooled and hardened quick enough, it would make a mould of the tree like the one found here. 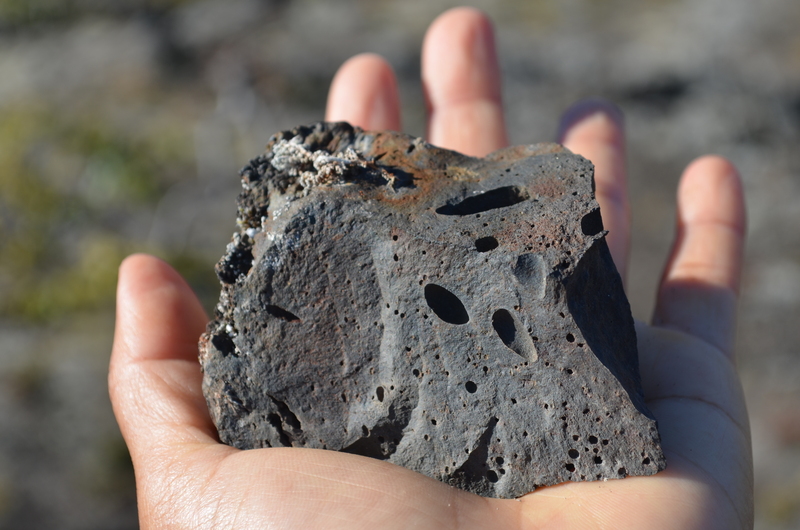 Within some moulds you can actually see the impression of tree bark in the lava. 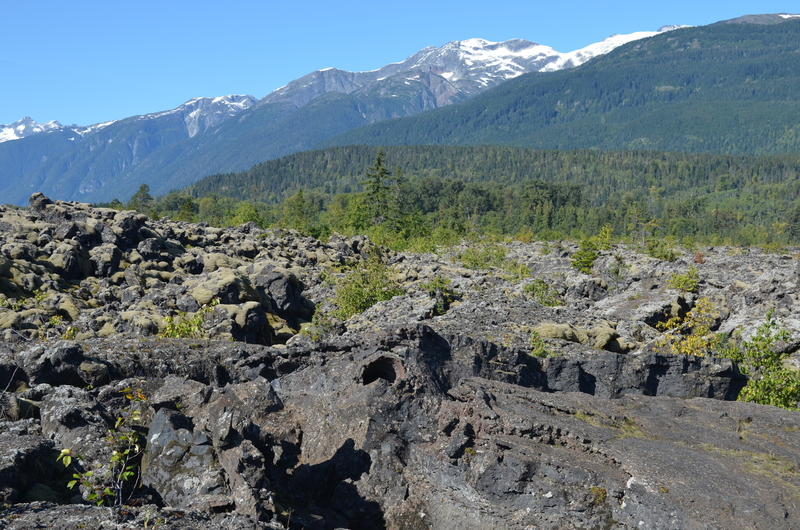 Many log moulds were lifted and carried for surprising distances by later eruptions of lava. 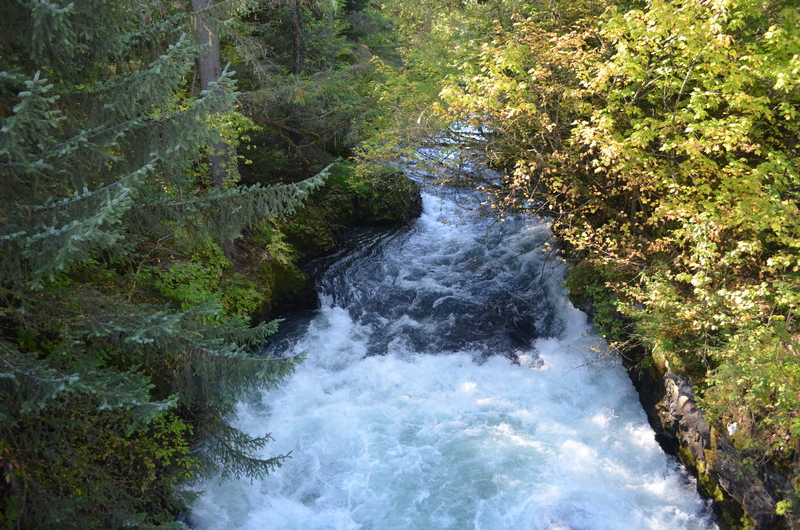 Tseax River in summer until Fall there are different salmon run each time includes spring salmon, chum salmon, pink salmon, sockeye and Coho salmon If you have Nisga’a or The First Nation License is allowed to fishing salmon in this river. 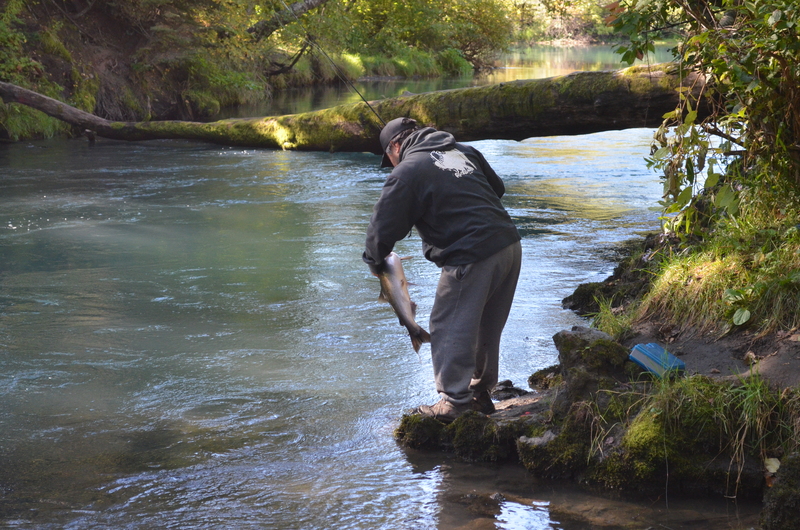 Not everyone can do fishing in this river only First Nation. 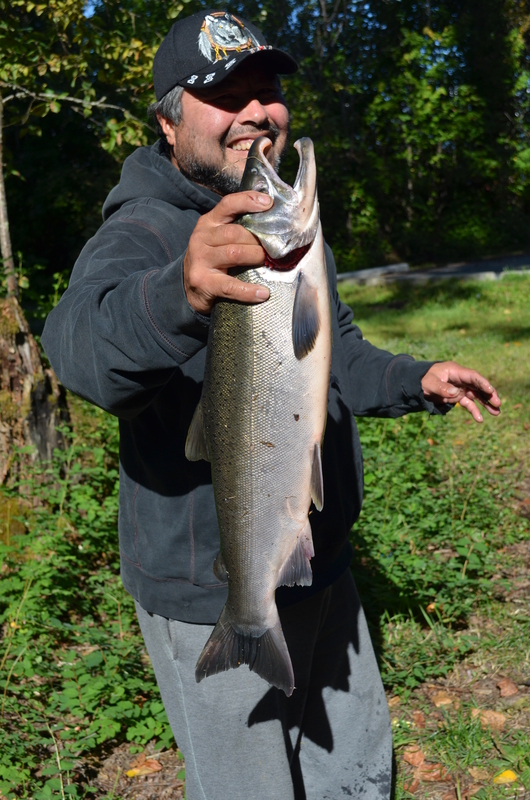 This man smile after he caught Coho Salmon. 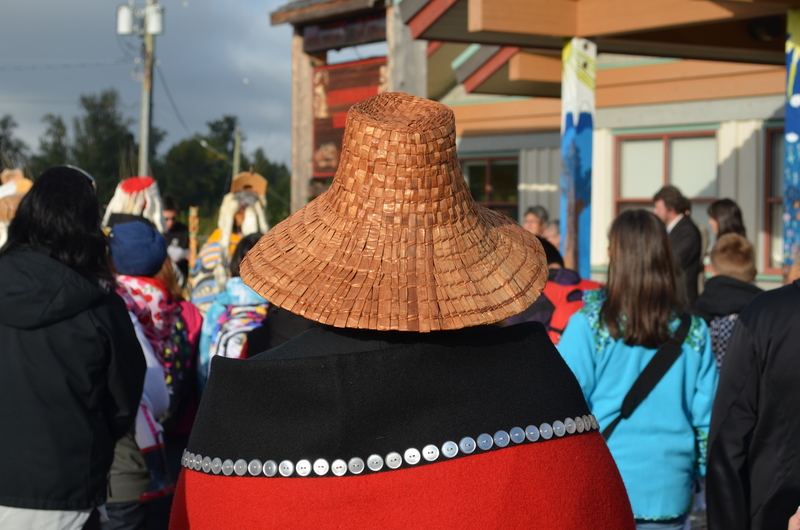 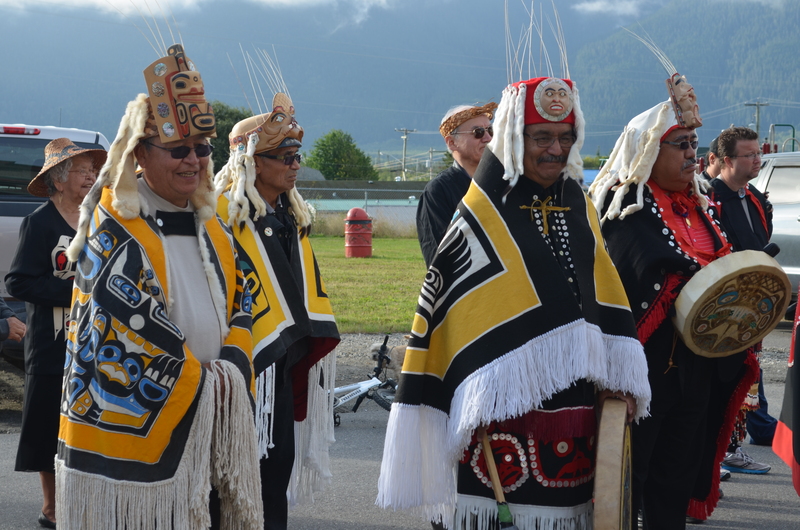 Nisga’a traditional chiefs costume worn for ceremony or special occasion. 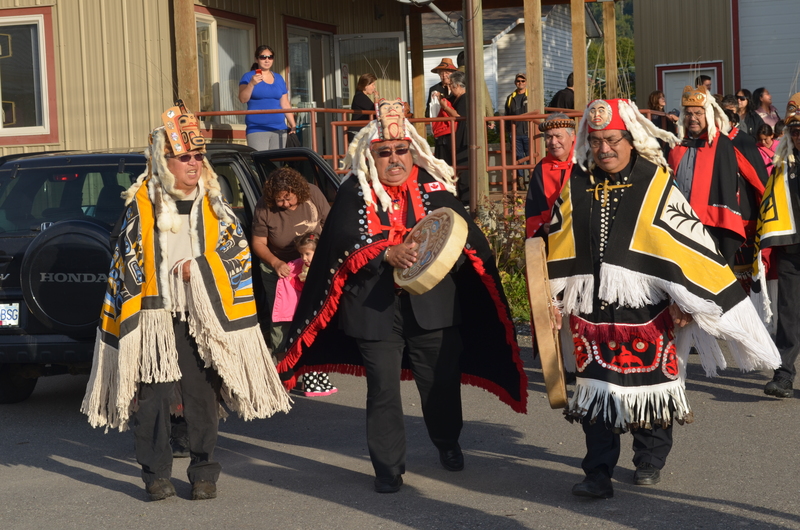 Gitwinksihlkw Elementary School and the Traditional ceremony for start of the school year. 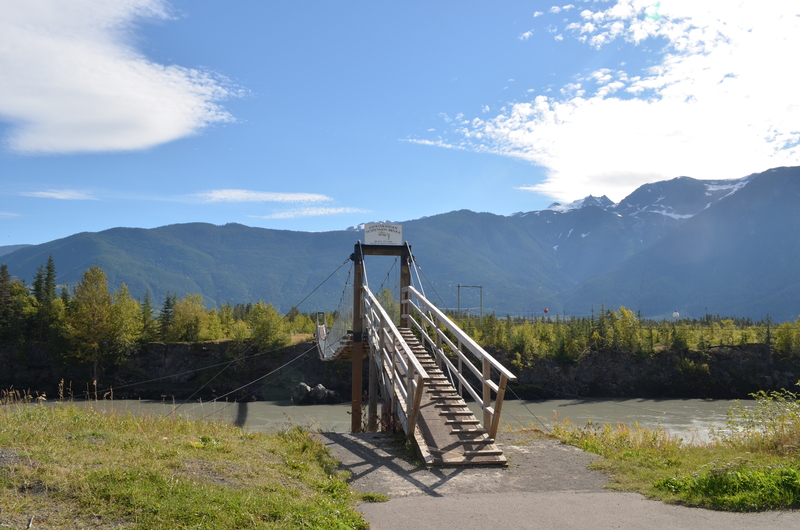 Until 10years ago this suspension foot bridge was the only connection to the outside world other than riverboats across the fast flowing rapids of the Nass River.